Congratulations to all of the 2019 IPTA Award Recipients! The IPTA is proud to have so many members who are dedicated to the advancement of the physical therapy profession. All REVITALIZE attendees took part in recognizing a few of our outstanding members during the Awards Luncheon, held in conjunction with this year's conference. IPTA President Mike Riley, PT and IPTF President, Sarah Jensen, PT presented several awards and recognized those members celebrating membership anniversaries! 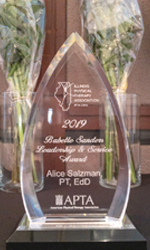 Alice Salzman, PT, PhD is the recipient of this year’s Babette Sanders Leadership & Service Award. Cori Zook -Arquines, PT, MHPE, CLT was named the 2019 Physical Therapist of the Year. Andrew Strubhar, PT, PhD is the recipient of the new 2019 Outstanding Academic Educators Award. Roshan Devarakonda, SPT and Morgan Lukert, SPT were both recognized as Outstanding PT Students of the Year. And Emma Battaglia, SPTA took home the 2019 Outstanding PTA Student of the Year Award. Congratulations to these awesome winners who are doing their part to REVITALIZE the practice of physical therapy. Read more about this year's award winners by clicking here. 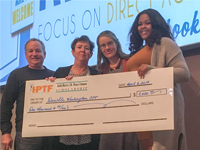 The Awards Luncheon continued to recognize outstanding members, as the Illinois Physical Therapy Foundation (IPTF) went on to present several student sponsorships and research grants. Three Illinois researchers were each awarded $1,000 research grants. 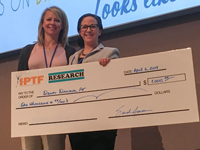 Dawn Drumm, PT for her research titled “Use of Tummy Time Intervention and Parent Education in Infants Born Preterm: A Randomized Controlled Trial". Julie Schwertfeger, PT, DPT,MBA, CBIST, is using her grant for her project “Community Interventions for Stroke”. Richard Severin, PT, DPT, CCS, PhD(c), for his research project “Respiratory Muscle Performance: A Predictor of Clinical Outcomes in Morbidly Obese Patients". Team Rehabilitation teamed up with the IPTF for a second year, to award students with $2,000 academic scholarships. The review committee had reviewed over 25 outstanding scholarship applications which were submitted, and were excited to award 5 students with scholarships this year. Congratulations to the following recipients: Lindsey Ardiff, SPT (Northwestern University); Ryan Pawloski, SPT (University of Illinois at Chicago); Amanda Baker, SPT (Bradley University); Jeni Boyarski, SPT (Midwestern University); and Melissa Mayer, SPTA (Oakton Community College). The Awards Luncheon concluded with a special presentation of a new IPTF academic scholarship this year! Julie Rosen, PT and her husband David Rosen established the Judith Harris & Dr. Monica Vohman Scholarship which was awarded to a first year DPT student who overcame challenges and financial need to become a physical therapist. Congratulations Danielle Washington, SPT from Governors State University who was chosen as the inaugural recipient. 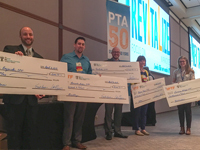 Also being recognized at REVITALIZE were our wonderful volunteers for taking on leadership roles and dedicating their time and service, and recognition of IPTA/APTA members for their years of membership ranging from five up to 70 years! REVITALIZE attendees who were celebrating an anniversary received pins upon checking in which were proudly worn during the REVITALIZE. Click here to see who is celebrating a membership anniversary!